HAPPY THANKSGIVING CATS AND KITTENS! In brief: after 9/11, although I have never loved New York and didn’t know a single person there in 2001, I was one of those Americans who sort of lost their minds. For 3 days I did nothing but listen to NPR and freak out. I had to leave grad school in the middle of the semester to go home to my mom for a week. I was treated for PTSD. And then one day I woke up and said to myself, wait a second, I’m a fantasist. I can escape this world any time I like; I just need to go back to my novel. We live in trying and complicated times. All QWERTYvsDvorak can offer is a moment of (hopefully) comedic escape. This is my first attempt at a purely visual gag. This Thanksgiving, I will offering gratitude for myriad blessings, and remembering those less fortunate and those whose lives, by a trick of fate, are so much more difficult than mine. QWERTYvsDvorak will be taking the week off to enjoy time with family and recover from whatever bacteria has settled in my lungs. Comics and updates resume Wednesday, December 3rd. Be good to one another, people. We’re all we have, really. 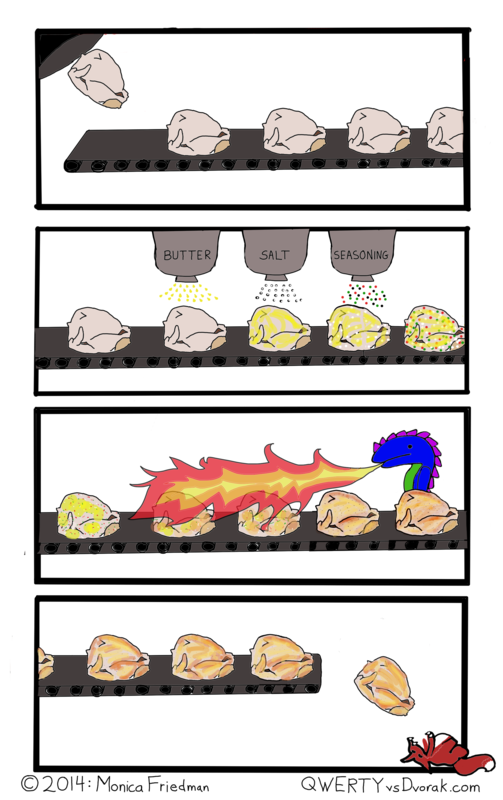 This entry was posted in Comics, Dragons and tagged binging, celebration, dragon, eating, excess, food, fox, gratitude, holiday, thanksgiving, turkey, webcomic on November 26, 2014 by littledragonblue.